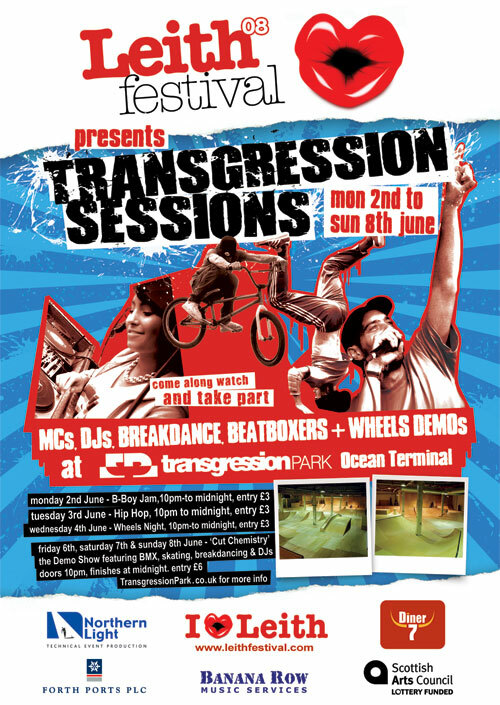 There are several shows going on in the skatepark after closing time during the Leith Festival. This promises to be an awesome series of shows. Northern Lighting and Banana Row have been in the park since installing the lighting and sound for these events. The sound system is about 10ft high and pumps out some massive sounds! Wheels night. £3 Entry. Watch in awe as the local talent from the skatepark wow you with the skills they have honed. In-line skates, BMX, Skateboard, extreme unicycle and watch out for some free running action also. Transgression Sessions. Featuring the best from all the previous nights, with music to blow your socks off, MC, Cut Chemistry, and a full lighting show. Promises to be one of the best shows at this years Leith Festival. All proceeds go to the Leith Festival Charity. Performers are doing these shows for free, and all proceeds from the door also go to the Leith Festival Charity. Doors open each night at 22:00.